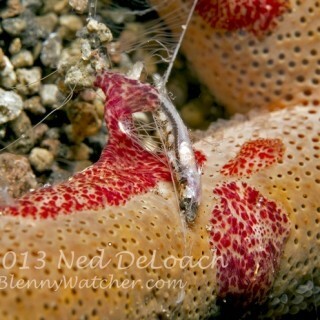 On our recent trip to Bali, I added a new blenny species to my Blennywatcher life list and observed what we are sure was spawning. 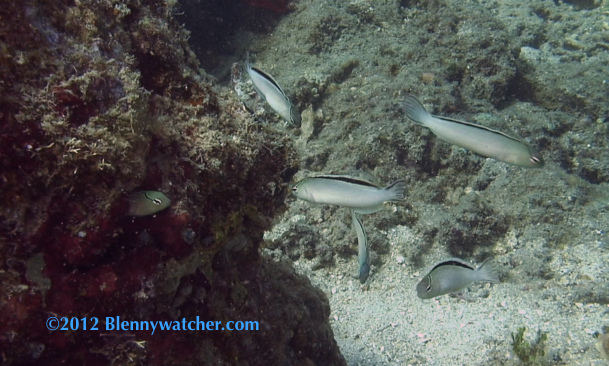 Excited by my initial sighting, I chased a little Smith’s Fangblenny, Meiacanthus smithi, down the reef, where to my surprise, it joined a milling group, whose attention seemed to be focused on a blenny peeking out of a hole. 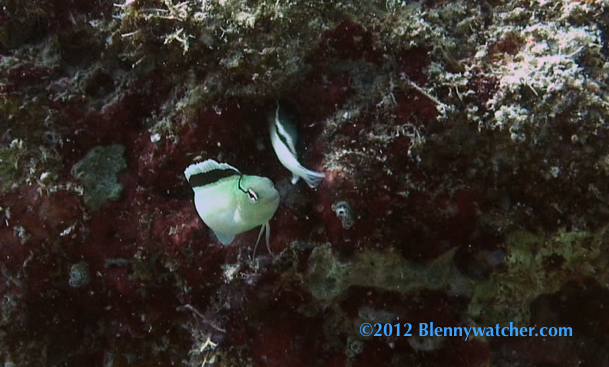 The blenny in the hole would emerge, gently lunge at one of the group and swim back to its hole. After watching it repeat this behavior several times, I realized that it must be a male trying to encourage a female to enter his home to lay eggs. Fangblennies are combtooth blennies of the family Blenniidae. The family is further divided into six tribes, one of which is the tribe Nemophini, a.k.a., the Saber-toothed blennies. The name sounds quite ominous, but they use their fangs for defense or to defend territories (although species from the genus Plagiotremus have been implicated in attacks on divers). 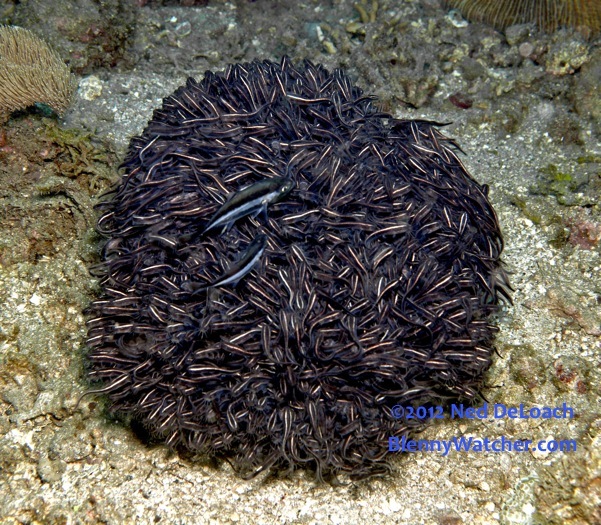 I have read that males will guard fertilized eggs until they hatch, but the nature of the homes they choose (usually holes in coral rock, on inside empty shells) makes it difficult to tell if there are eggs present. 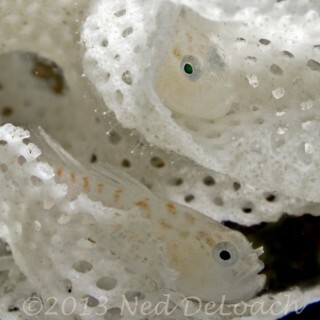 Although written primarily for aquarists, there is a good overview of fangblennies of the genus Meiacanthus over at Advanced Aquarist that includes a photo of blenny eggs in a pipe. 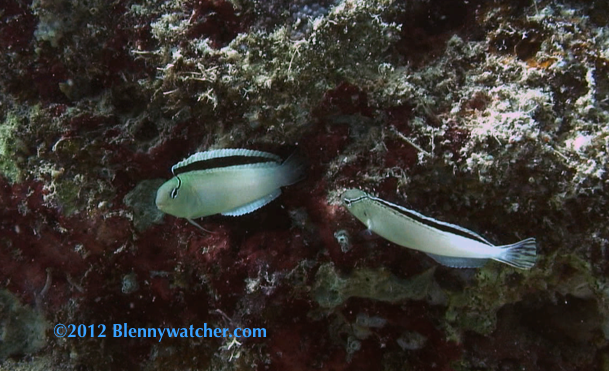 Here, the chances of seeing the eggs would be slim even though it looked like we were witnessing spawning because of the location and size of the blenny’s hole. By the time Ned caught up with me, I had been watching the male courting the females for about five minutes. Finally, one of the females entered his hole, he looked in, then backed into the hole to join her. After about five seconds he disappeared completely but just before he did, he bared his little fangs – something I had only seen once before. You can see it in the video below, but it happened quickly, so watch carefully. The crowd dispersed and I followed a couple of what I guessed to be females down the reef where they encountered another courting male. Another fabulous behavior encounter!!! Love these Anna!!! 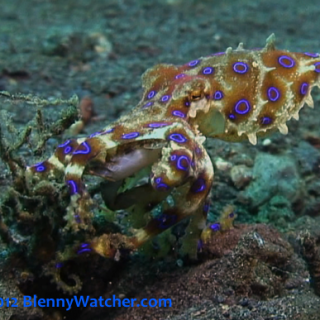 Red, I’m happy to have this opportunity to introduce you to the world of blennies and thank you for sharing your knowledge of bottles. I’m looking forward to learning a lot more about antique bottles, my latest obsession!